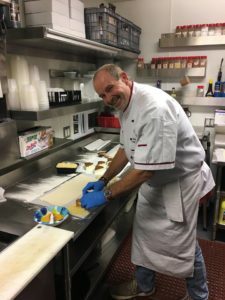 Michael Guessefeld is a Chef with over 25 years of cooking experience. 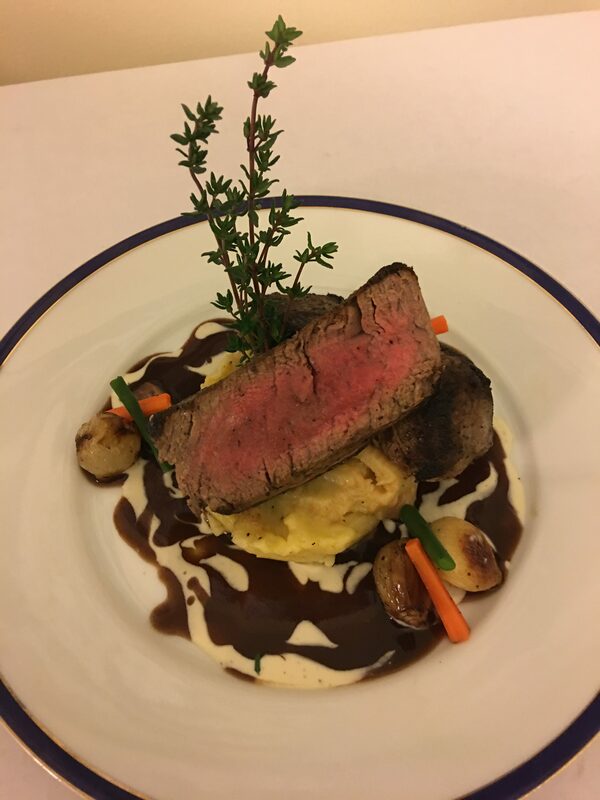 Graduating from the Culinary Institute of America, Chef Guessefeld worked in some of the finest “haute cuisine” restaurants in Manhattan & Northern New Jersey. As a Chef he made it his mission to find the highest quality ingredients for new and creative dishes. That same drive for excellent food products now fuels Chef Michael’s Home Delivery. 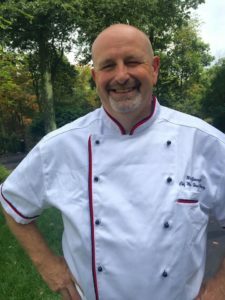 “Executive Chef Michael Guessefeld has developed a menu featuring the freshest and most unusual American provender embellished with unexpected sauces (for example, warm lobster served with a Sherry vinaigrette) adding up to a sophisticated dining formula that attracts a high-powered clientele.” – New Jersey Reader’s Choice Awards, 1987. Voted “Best of the Best”. “Guessefeld’s intellectual approach to food and his consummate skills enacted novel concepts make him a standout chef. His innovative cuisine, solidly anchored in classic French techniques is a composite of regional American and oriental cookery coupled with modern culinary concepts and a dash of nutritional notions.” – Daily Record, Morris County NJ, 1992. “…Chef Michael Guessefeld … the menu changes seasonally and is executed with a sure, trained hand…sauces are marvelous, and many of the more difficult classical dishes – terrines, feuilletees, and souffle’s are beautifully rendered.”– NJ Monthly, 1989. “Michael Guessefeld, the Chef, produces some truly delectable dishes…Mr. Guessefeld who is just 24 years old, already shows potential for a 3 star performance.” – The New York Times 1981, 2 stars. “Michael Guessefeld…first rate chef.” – The New York Times 1984, 3 stars. Hi – I’m Michael Guessefeld and I own/operate Chef Michael’s Home Delivery. I deliver high quality food products to the home. No contracts, no commitments- you get what you want, when you want. I’m always searching for new products as well as expanding my own specialty preparations. My products are flash frozen and super convenient. My steaks, seafood and poultry are cut to my specifications by top suppliers and trimmed of unwanted fat, gristle, skin, bone and individually cryovaced and able to store in your freezer for at least a year without a measured depreciation of quality.You simply thaw and cook. This is not a gourmet food service per se. I have a full spectrum of products that appeal to everyone from kids to gourmets and those in between. From Chicken Fingers to Filet Mignon to my own specialty preparations. I’m very proud of my business and I would suggest that my products have a qualitative edge that separate them from like products found in the mainstream marketplace. For instance my Mac & Cheese has Fontina, Pecorino Romano, and Parmigiano Reggiano cheeses included in its high end ingredient roster. I have Poussin (young all natural chicken) from a world class Quail farm in New Jersey. I have French delicacies like Calves Brains and Veal Sweetbreads. My Escargot in Pastry are superb nuggets taking a classic gourmet food product to a new level. My Brie in Pastry with a Rosemary infused Fig/Walnut Jam has a clever culinary edge. My Gratin Dauphinois (scalloped potatoes) and the Galette de Pomme de Terre (Potato Tart) are splendid renditions of the French classics. I invite you to scroll through the different categories on my site and get a feel for the product line. Don’t forget to check out the “Specialty” section‍‍. If you have questions/comments, want to order product, or would like a 15 minute presentation of my products please contact me. I look forward to hearing from you. P.S. The three food pictures are from a Christmas dinner I did for a customer in 2016. 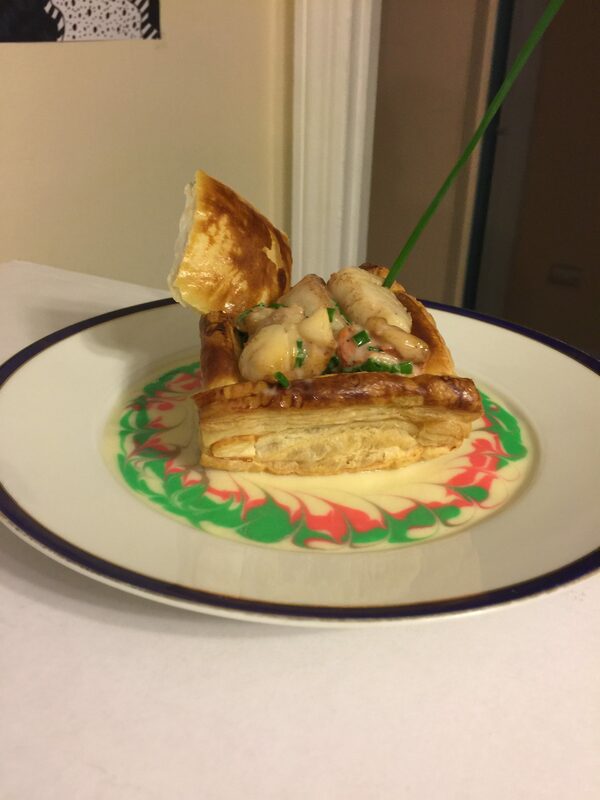 Lobster and Scallops in a pastry basket with a Chive Beurre Blanc and decorated with Christmas colors. Filet Mignon resting on an island of my Mac+Cheese, Roasted Garlic Cloves, Shallots and sauce Marchand de Vin (red wine sauce). 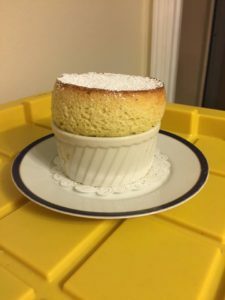 Grand Marnier Soufflé for dessert.